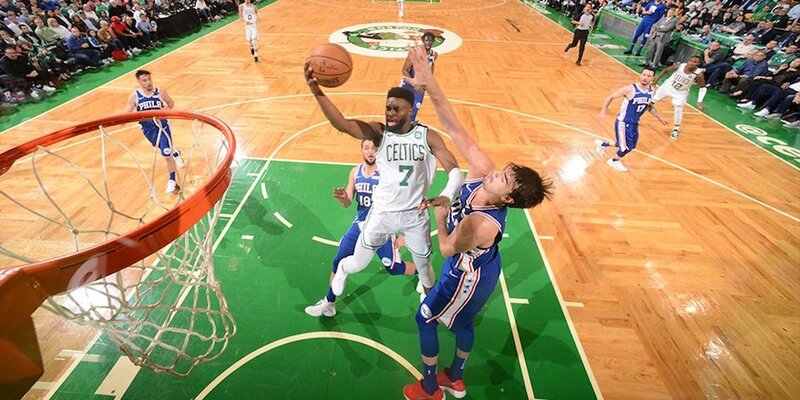 In an energy-filled TD Garden, the Boston Celtics beat the Philadelphia 76ers 114-112 in Game 5 and will now play in the Eastern Conference Finals for the second year in a row. Boston had a shakeup of their starting five, with Jaylen Brown sliding back into the lineup in place of Marcus Smart. The Celtics came out with lots of energy, but the Sixers were equal to the task, shooting well in the first seven minutes and controlling the tempo. In the first quarter, Ben Simmons laid a punishing dunk on the rim, atoning for his missed dunk in Game 3. Smart and Jayson Tatum combined on a give and go to produce a highlight reel slam of their own off a steal from Joel Embiid. The Celtics defense kept Boston in the game despite shooting woes midway through the first quarter, and they went into the second quarter up 25-24. Embiid was strong in the second quarter, but the Celtics answered primarily through the slick handles of Tatum. The Sixers committed a lot of turnovers in the second quarter, and the Celtics were able to capitalize. Marcus Morris had been relatively quiet so far in Game 5 and shot poorly from the field. Without Shane Larkin available, coach Brad Stevens elected for a shorter bench, going with only a seven-man rotation. The Celtics weren’t doing much through most of the second quarter—just settling by trading baskets back and forth—with no team really wanting to go on a run. Towards the end of the half, however, Aron Baynes became the catalyst for the Celtics. He hit a three-pointer to give the Celtics a four-point lead with under a minute to go and played excellent defense on Embiid to keep the crowd on their feet and allowed for Tatum to fly down the court with a layup. Terry Rozier finished the half with a big buzzer-beating three to give the Celtics a 61-52 lead at the half. Tatum and Rozier led the Celtics at the half with 14 and 11 respectively, while Embiid led the way for 76ers with 12. The big advantage for the Celtics in the first half was second-chance points, beating Philadelphia 11-2 in that category. In the third quarter, the Celtics came out hustling on the glass, with one key possession early in the quarter in which they grabbed two offensive boards, made possible by Baynes, and Brown drained a three to bring Boston fans to their feet. The Celtics kept up their steady diet of ball movement on the 76ers, and it paid dividends as they lengthened their lead steadily as the quarter progressed. Interestingly, Stevens did not take Baynes out around the halfway mark of the third like he usually does—probably because of a combination of the fact that Marcus Morris had a woeful night from the field and the fact that Baynes was the energy that paced the Celtics throughout the third. Baynes even drew a technical foul on Embiid, who grew frustrated as he committed a foul on the Australian as he headed to the bucket. Philadelphia wasn’t done, however. Embiid and Dario Saric put on a two-man show to cut the Boston lead to four with just under three to play. The 76ers continued to grind, and Embiid scored 11 in the quarter and J.J. Redick hit a tough shot towards the end of the quarter in transition to cut Boston’s lead to 2 going into the fourth. The Celtics’ plan finally came to fruition at the start of the fourth, as the constant picking on J.J. Redick when he was playing defense finally paid off as Brown hit multiple shots to start the quarter. The 76ers hung tough with timely threes, but the Celtics found themselves in the bonus just 2:30 into the fourth quarter. The two teams traded baskets back and forth from there—tied at 94 with just over six minutes to play—when Al Horford played bully-ball down low and scored again on the next possession to give the Celtics a four-point lead. Horford followed it up with a steal on Saric leading to a Terry Rozier fast break, and Philly was forced to call timeout. Dario Saric hit a three late, however, giving the Sixers a three-point lead with under four minutes to go in the game. The Celtics put a charge into their fans down the stretch as Horford came up with a steal with under a minute to go. Smart then passed the ball to Tatum who gave Boston the lead with 22 seconds to go. It came down to one more stop. Philadelphia gave the ball to Embiid, and Baynes was able to put the brakes on him, causing Embiid to turn the ball over down on the baseline. The Celtics got the ball back with 10.7 seconds to go, and Rozier hit two free throws to put the Celtics up four. Redick hit a tough three to cut it to one with 3.8 to go, and Marcus Smart came up with the clutch steal at the end to seal a 114-112 victory for the Celtics. The player spotlight definitely has to go to Baynes. He gave the Celtics the spark they needed at the end of the first half, made clutch plays in the third quarter and when the Celtics needed a stop most, he came through again in the clutch against Embiid. The Celtics defied Vegas and the sports media by overcoming the Philadelphia 76ers, and now their biggest test in the East remains—LeBron James and the Cleveland Cavaliers. Game 1 of the Eastern Conference finals is set for Sunday, May 13 at 3:30 p.m. in Boston.